but anyway, the ad was a united airlines ad, and when i first saw it, i thought nothing of it. i walked about 10 feet and it dawned on me just how inappropriate this ad could be. 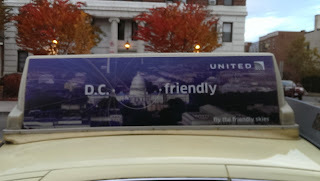 i'll apologize for the poor quality of the photograph, but the ad says "dc friendly" and is for united airlines. there are two route termination dots of either side of the capitol dome. do you see where i'm going with this? in a post 9/11 world we as marketers have to think about perception and reality. the ad isn't offensive until someone remembers that investigations revealed that united flight 93 was either in route to the white house or to the capitol building. anyone else seen any seemingly innocent ads that when they look closer that it was in poor taste?